How do flashing LEDs work? In a comfortably cobwebby place there hangs a cork-board. And pinned to it, amidst a camp of construction-paper bats, Count Chocula’s signed mini-poster, and a drawing of the Mach 5, is a crumpled piece of notebook paper. Smudged pencil scribblings cover both sides in an apparently continuous scrawl, but look closer and you’ll see it’s a list; a catalog of sorts. It’s late August, Labor Day is coming, and I’m staring at a project list that has burst out the garage door and plowed through the overgrown hedge at the end of the driveway. As I stand here watching, it’s roughing up a rabbit in the neighbor’s yard. Still, if I’ve learned anything from Kristy McNichol and a herd of ABC After School Specials, it’s that you have to stand up to a bully. Don’t let him spoil your fun because the only real power he has over you is what you give him. Oh, and never ever let the ranger dart the baby deer you’re nursing back to health. In other words, sometimes you’ve just gotta chuck the plan and follow your nose. To illustrate the point, I present a note we received this morning. What follows is an excellent example of dropping everything, tearing across the room, yelling “squirrel!”, and jumping out the window. Excellent question! A flashing LED contains a very tiny integrated circuit called a multivibrator. A multivibrator circuit is used in a variety of applications that require switching between two states, and there are three distinct types: astable, monostable, and bistable. The astable multivibrator is stable in neither state (states are “on” and “off”) so it oscillates back and forth continuously. The period of oscillation (frequency of change) is determined by a built-in capacitor/resistor network. A monostable multivibrator, or “one-shot”, is only stable in one state for a period of time. After it is triggered, it will eventually return to its stable state, which makes it really handy as a programmable timing circuit. A bistable multivibrator, or “flip-flop” is equally stable in both states. When it’s triggered, it will flip states and stay there. All of this can be accomplished in the astable circuit with a pair of transistors, two capacitors, and four resistors -discrete components that only the very very nerdy, old-style Radio Shack types (cough) have squirreled away in their garages and shops in neat rows of little plastic bins. The first vacuum tube multivibrator circuit was completed in 1919 by radio and electronics pioneer William H. Eccles and his trusty side-kick Frank Jordan.1 Jordan had a side-business in thermogalvanometers2, but… well, he got really into the 20s, and no one ever saw him again. But a flip-flop isn’t what’s inside a flashing LED, so once again Mr. Jordan is relegated to the mists of obscurity. 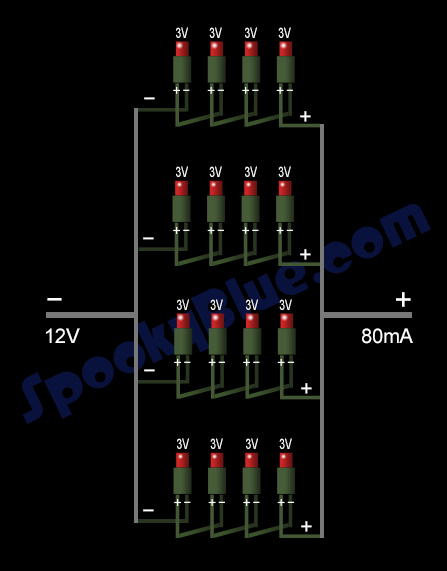 Your garden variety Spookyfire Blob flashing LED has built into it a tiny little astable multivibrator circuit. The thing about these guys is that whether they’re constructed out of massive discrete components or microscopic little doo-hickeys, they’re not very accurate. I mentioned earlier that the duty cycle can be changed by varying the resistance and/or capacitance values in the circuit. 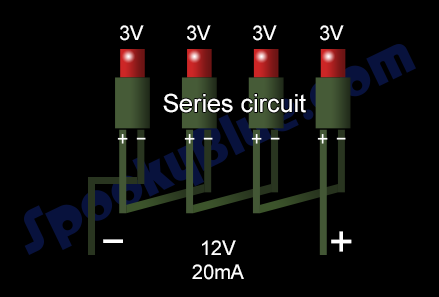 If these components vary in the least bit from one circuit to another (or one LED to another), their frequency relative to one another will be slightly different. Since these components (both big and little) often have 5%, 10%, and even 20% tolerances (the % difference between the stated and actual value of a component), you now have your answer. Why don’t all the LEDs in a Spookyfire Blob just blink on and off together? Blame F.W. Jordan.